Pra�a da Rep�blica Rio-Grandense, without number, Old Pra�a das Alegrias. The monument celebrating the centenary of the capital was constructed in rose granite. It is located on the Largo das Bandeiras, across from the Piratini's City Hall. The bronze plaque portrays Bento Gol�alves da Silva. It was sculpted by Augusto Pastorello. 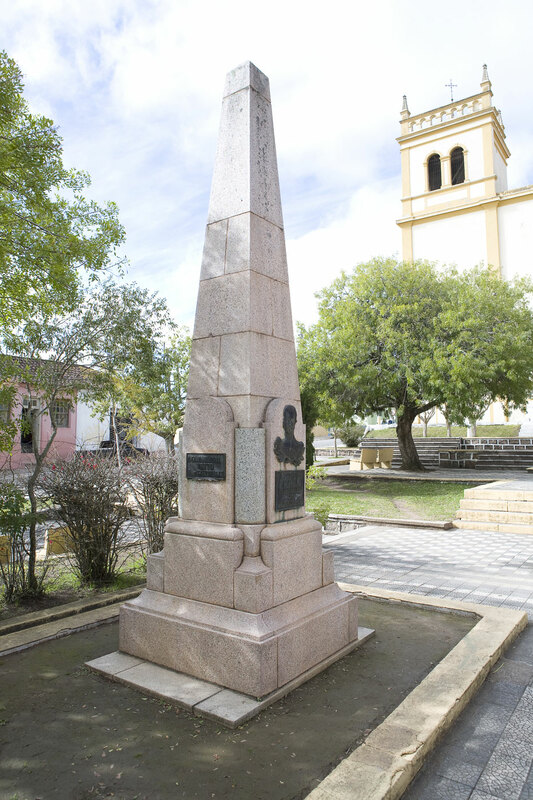 The sesquicentennial of the Farroupilha revolution is also celebrated in this monument. Bento Gon�alves da Silva (1788-1847) was born in Triunfo. He came from a traditional family. When he was 23 he joined the armed forces. He got married to Caetana Garcia in 1814. Ms. Garcia was Uruguayan, daughter of a Spanish rancher and a Brazilian mother, of Azorean descendant. Mr. da Silva and his wife had nine children. In 1816, in Serro Largo, Uruguay, Bento Gon�alves, already a prosperous rancher, had a business of cloths and drinks. In 1820 he took part on the campaign that attached the Banda Oriental del Uruguay as Cisplatine Province, to the United Kingdom of Portugal, Brazil and Algarves. The treaty was signed in 31 July 1821. He stood out during the Cisplatine War on the Brazilian side. He became Superior Commander of the National Guard of the Province and deputy of the Provincial Assembly in 1834. Bento Gon�alves was one of the mentors of the Farroupilha Revolution (1835 � 1845). He was imprisoned during a battle at Fanfa Island in 1836. When the Rio-Grandense Republic was proclaimed, he was still a prisoner in Bahia. Nevertheless, he was elected as president of the novel Republic. As soon as he was released, he assumed his post. In 1843, Bento Gon�alves da Silva resigned the presidency in order to avoid conflicts with the already divided republicans. By this time, he commanded only the military division. The war ended with the signing of the Poncho Verde Peace Treaty on March 1st, 1984. The agreement guaranteed amnesty to all involved in the conflict. As a result of 10 years of war, Bento Gon�alves became financially depleted. He went back to his only remaining possession, the ranch Cristal, on Camaqu�. The ranch was his father�s property. Distraught with the further developments of the political scenario, he retired from the public life to take care of his own business and family. At the age of 58, he died in Gua�ba in the house owned by his Farroupilha friend, Jos� Gomes de Vasconcellos Jardim. The Cristal Ranch is now home to the Historical Park General Bento Gon�alves da Silva. The sculptor and illustrator Augusto Pastorello, author of the portrait in relief on the monument, was born in France. He was the son of Italian immigrants who moved to Pelotas to live at the French Colony Santo Ant�nio at the end of 19th century. 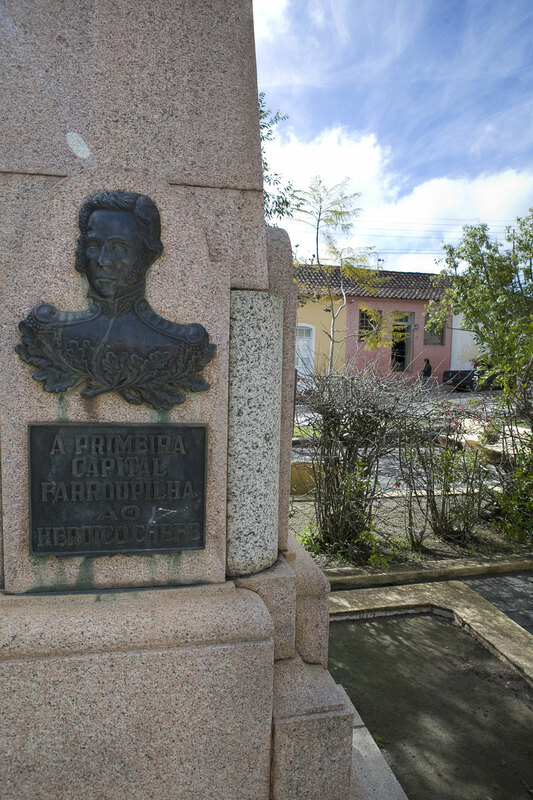 He was commissioned to create pieces for Pelotas' Commercial Club, the Piratini's City Hall, and of and many busts, monuments and celebratory plaques.